Atik, as any other WordPress theme, allows you to define which page will be displayed as your homepage/frontpage. You can choose to always display your latest posts, or a static page. In order to set this up, go to Appearance > Customize and go to "Static front page" panel. 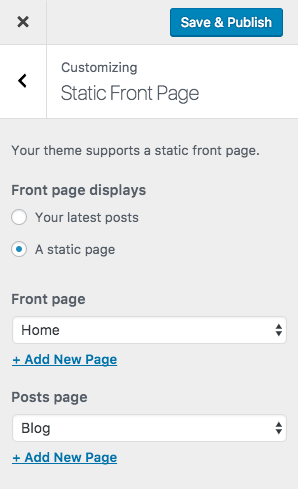 Select the second radio button so that your front page is set to display a static page, and from the dropdowns below, choose a static page from the list as your Front page, and another for your Posts page. If you have followed the previous article on the widgetized page template, you should by now be able to create a homepage layout based on widgets. If you simply select the widgetized page you have created, to the Front page dropdown, your site should now use that page as the homepage.